Design philosophy Piano believes architecture is one of the ways in which people tell stories, and that we must never be content with just one result, but rather should continuously be striving for more. Distinctive style He has avoided any one recognisable signature so as not to be confined by expectations, but is a firm believer in coherence, and a common thread throughout his varying projects is that they are lightweight and contemporary structures. Major works The Shard in London (2000-2012); the Centre Georges Pompidou in Paris (1971-1977); Kimbell Art Museum expansion in Texas (2007-2013); The New York Times Building in New York (2000-2007). Honours RIBA Gold Medal 1989; Kyoto Prize 1990; Neutra Prize 1991; Erasmus Prize 1995; The Pritzker Architecture Prize 1998; The Sonning Prize 2008; AIA Gold Medal 2008, among others. After leaving, he collaborated on various high-profile projects with highly regarded architects, including Louis Kahn, Richard Rogers (with whom he founded Piano & Rogers 1971-1977) and Peter Rice (with whom he shared L’Atelier Piano & Rice 1977-1981), before going on to establish Renzo Piano Building Workshop (RPBW) in 1981. 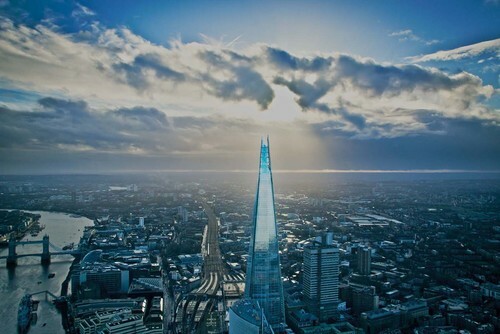 One of the most iconic projects Piano has worked on is the London Bridge Tower, more commonly known as The Shard. He managed to achieve something rather special with the tower by creating a mixed-use space that’s both public and private. So often skyscrapers are closed off to the inhabitants of a city and exist as symbols of power, wealth and exclusion, but the London Bridge Tower was designed not only to be used by the city, but loved by it also. 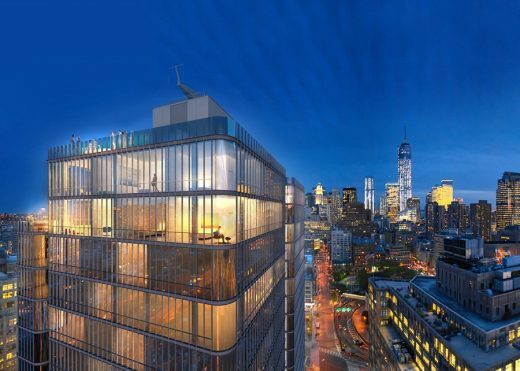 It houses office space, a hotel, restaurants and bars, and a viewing gallery on the 68th, 69th and 72nd floors, open to all (tickets must be bought in advance). The Shard is rather like a vertical city, with commercial, residential and public spaces all accessed by public transport. 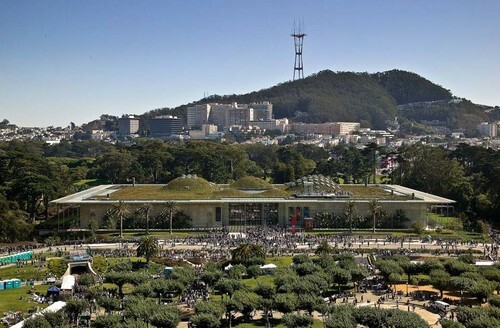 The California Academy of Sciences is one of the largest museums of natural history in the world, and is located in Golden Gate Park, San Francisco. It is home to more than 25 million species. The original structure was damaged by an earthquake, and Piano was brought in to create a replacement. His structure melds form with function, and effectively conveys a love for nature and an appreciation of the fragility of the earth through its sustainable design. The Centre Pompidou, or Beaubourg, in Paris, is a multi-disciplinary public space – a Museum, a library, a design centre and a music centre. It is made primarily of glass and steel, with various coloured tubes protruding from the structure, in great contrast to many of the other cultural institutions in Paris. ‘The Beaubourg is… about the joy of life. It’s a rebellion,’ Piano told Marcus Fairs. Protests in 1968 sought to overthrow Pompidou’s government. 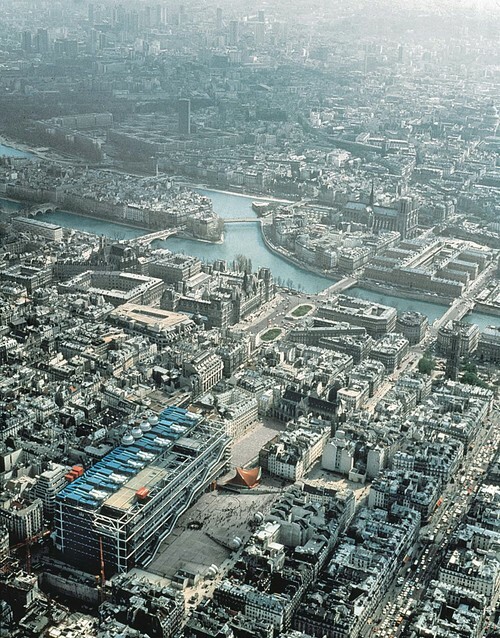 Although the revolution never happened, ‘it was a highly active period of politics, and you could argue that it was a part of the concept [for the building]… We wanted to catch what was going on at the moment,’ explains Richard Rogers in an interview on the project. 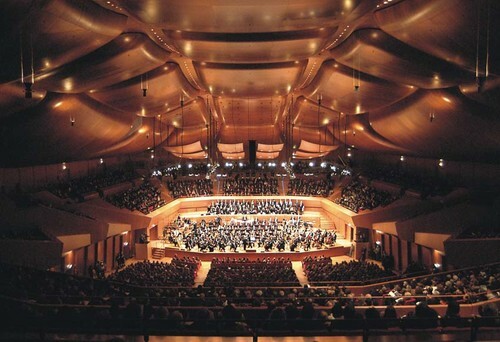 The Parco della Musica Auditorium in Rome was completed in 2002 by RPBW. Its construction was announced as a competition by the City of Rome in 1993; they wanted a multi-purpose complex in which various musical and cultural events could be held. ‘It’s a real “city” for music,’ say RPBW. Pictured above is the Santa Cecilia Hall, which has 2,800 seats and is used for symphonic concerts. The cherry wood ceiling was carefully constructed to ensure the hall became a place ‘where listening to music becomes an almost religious experience,’ say RPBW. Art collector Ernst Beyeler and his wife, Hilda Kunz, had an extensive private art collection, including works by Monet, Cézanne and Picasso, which they exhibited in various museums across the world before deciding to give it a permanent home. 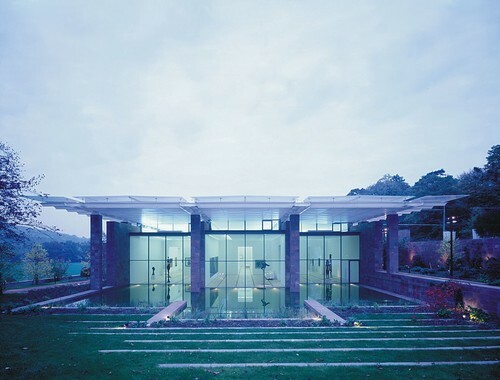 Beyeler commissioned Piano to design the Beyeler Foundation Museum in a secluded spot in the grounds of an 18th century villa near Basle, Switzerland, away from the stresses of everyday life. 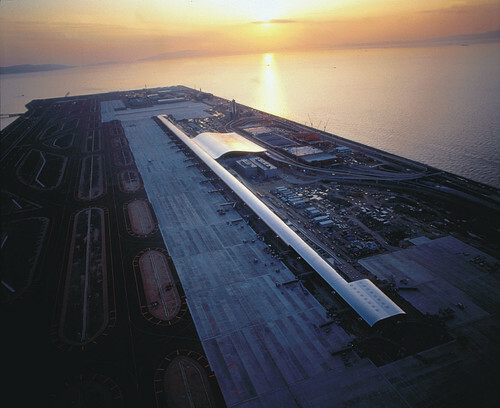 Located on an artificial island in Osaka Bay, Kansai International Airport was constructed to provide relief to the overcrowded Osaka International Airport. The artificial island construction was begun in 1987 and involved 1 million workers and 10 million hours over three years. It took land from three mountains to fill a sea wall needed for the construction. The terminal building’s long, slim shape resembles a glider seen from the side. It was specially designed to be able to withstand earthquakes, which are common in the area. 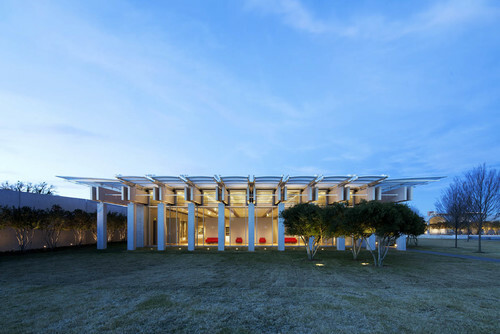 Naturally, the headquarters of Renzo Piano’s Building Workshop are no less remarkable than many of the other structures he’s designed over the years. 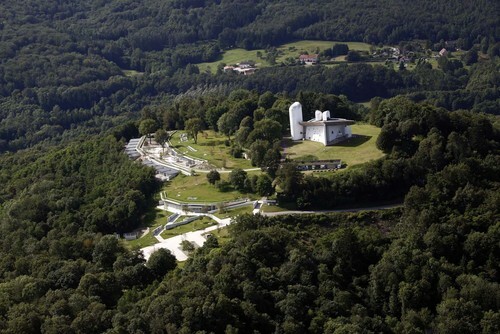 It’s built on a sloping hill on the edge of Genoa that trundles down to the sea. The offices are a series of terraces built largely with glass and wood, giving them a conservatory-like feel that connects them to the tranquil landscape surrounding them. As offices go, they have to be up there with the best. In the foothills of Notre Dame du Haut in Ronchamp stands a chapel and convent for the Poor Clare nuns. The chapel itself (pictured at the top of the hill) was designed by Le Corbusier and completed in 1954. In 2006, RPBW was commissioned to design a convent for the sisters and a welcome building for visitors. The convent is embedded into hillside, bordering the trees. It features living roofs, bare pale cement walls and zinc window awnings. The museum itself was designed by Louis Kahn in 1972, but its collection grew dramatically and quickly exceeded the gallery space allowed. RPBW designed and built a new building, roughly doubling the gallery space and adding in classrooms, studios and a large auditorium. While Piano’s new building echoes the older structure, it has its own distinctive character – lightweight, open and transparent. To mark the 500 year anniversary of the discovery of America, the 1992 Columbus Celebrations provided the impetus for further regeneration of the Port Antico (old harbour) in Genoa, Renzo Piano’s home town. Alongside the restoration of numerous historic buildings, quite a few new structures were built, too. The aim was to reconnect the historical centre of Genoa with the old port, and to create an additional bustling and beautiful area of the city. Harvard’s three museums – the Fogg Museum, the Busch-Reisinger Museum and the Arthur M Sackler Museum – are undergoing reorganisation to become just one facility. The transformation unites three diverse museums and their expansive collections under one roof, introducing contemporary modifications to a historic building in a sensitive, responsive and sustainable manner. e-architect feature a short video from this show. The Shard : the major Renzo Piano design to be completed so far. Exclusive photos on e-architect tracked the construction from start to finish. At a height of 310 metres (1,020 feet) and with a total 72 occupied floors reaching skyward into a breathtaking 15 story spire, the building is now the tallest building in Western Europe. 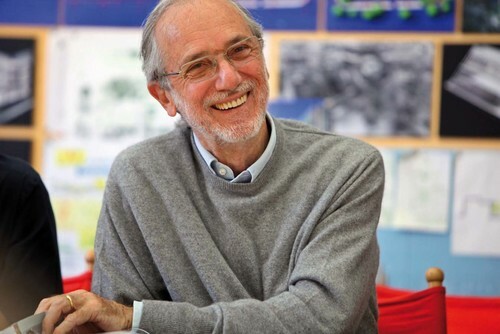 Renzo Piano was born in Genoa, Italy, in 1937. 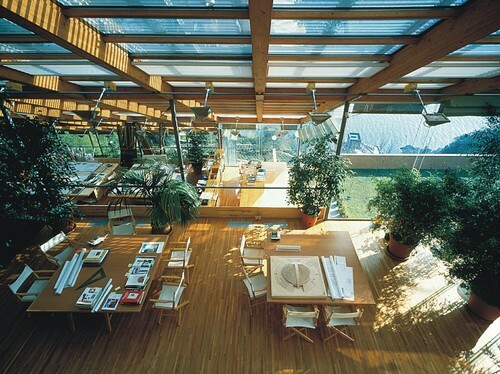 Renzo Piano established Renzo Piano Building Workshop in 1981. RPBW has architecture offices in Paris, Genoa and New York. September 2, 2016 in Architects.